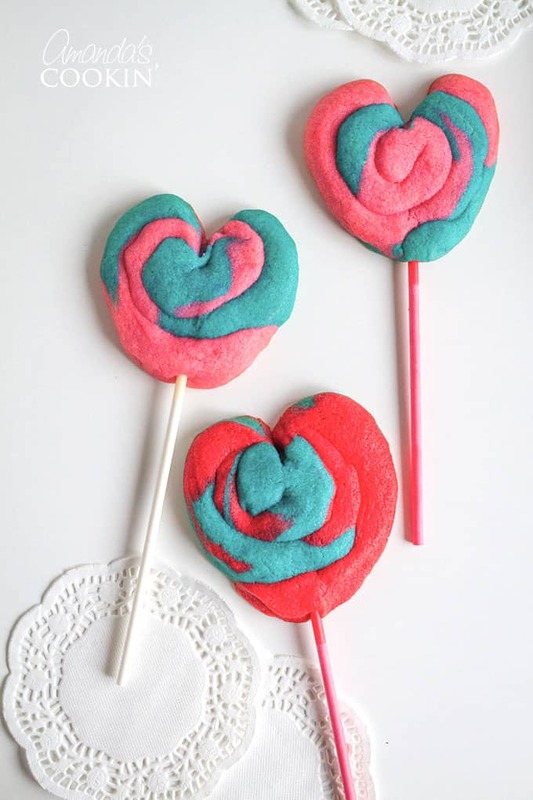 Valentine Play Dough Cookie Pops: heart shaped sugar cookie pops! 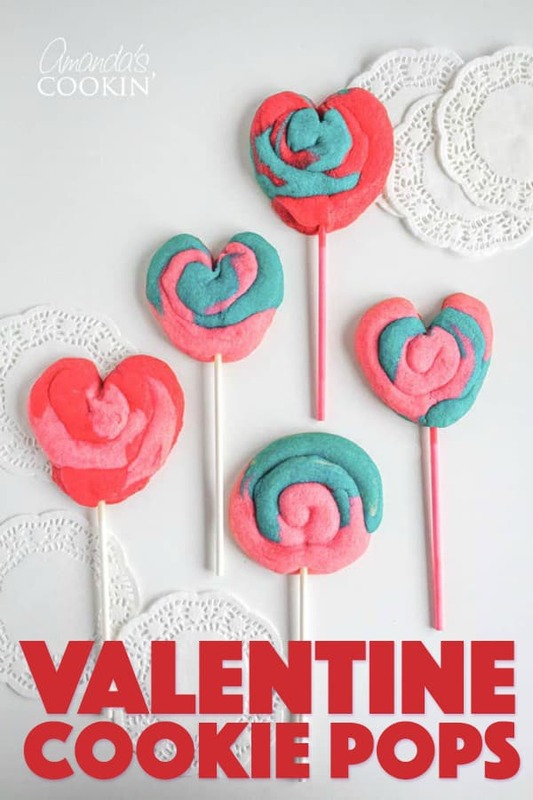 These Valentine Play Dough Cookie Pops are a fun colorful treat for the kids to help make and give to their friends or teacher. They aren’t really made of Play Dough, but their fun colors remind us for Play Dough! Shape them into hearts for an even more special Valentine’s Day goodie, just like my Heart Shaped Valentine Cupcakes, which are another great V-day edible gift! My play dough cookies are made from a simple sugar cookie dough tinted with paste food coloring, then rolled into balls and eventually snakes to twist up and make fun color combinations. 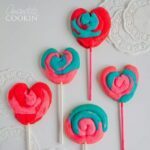 You can find this recipe in several places, but I used some Valentine colors and shaped some into hearts. These cookies last a while too! I wrapped them in plastic wrap and tested one each day (it’s a dirty job, I know), they tasted just as good on the 6th day as they did the 1st. These were lots of fun, well received and easy to make. In a medium bowl combine flour, baking powder and salt. Add dry ingredients to the creamed mixture. Stir till soft dough forms. Divide dough according to however many colors you plan to use. Tint each with a different food color. Wrap in plastic wrap and chill for 2 hours. Preheat oven to 350 degrees F. Shape dough into 3/4 inch balls and for each cookie place 3-4 different colored balls together to make 1 large ball. Roll it just enough to form a rough ball, then shape into a 12-inch long roll (like a snake). Starting at one end, coil roll to make a 2 3/4 inch round cookie. Place cookies 3 inches apart on lightly greased baking sheet. 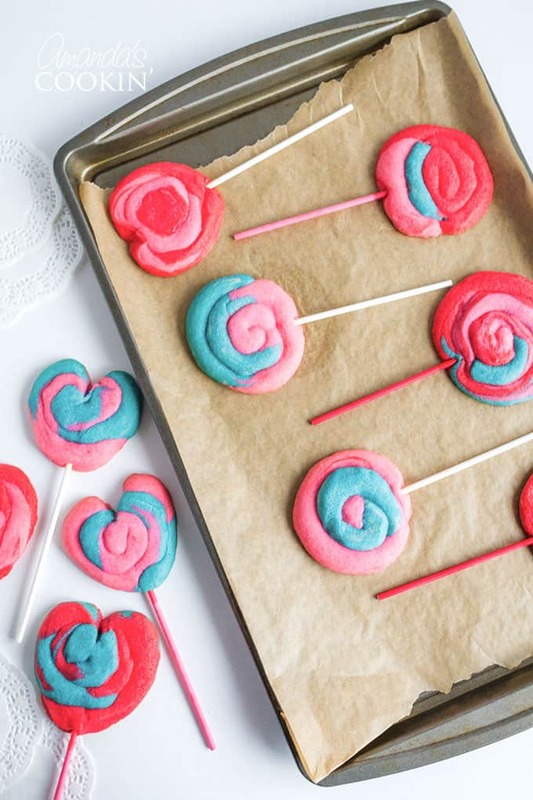 Carefully insert lollipop sticks into bottoms of cookies. For hearts, follow the instructions above. 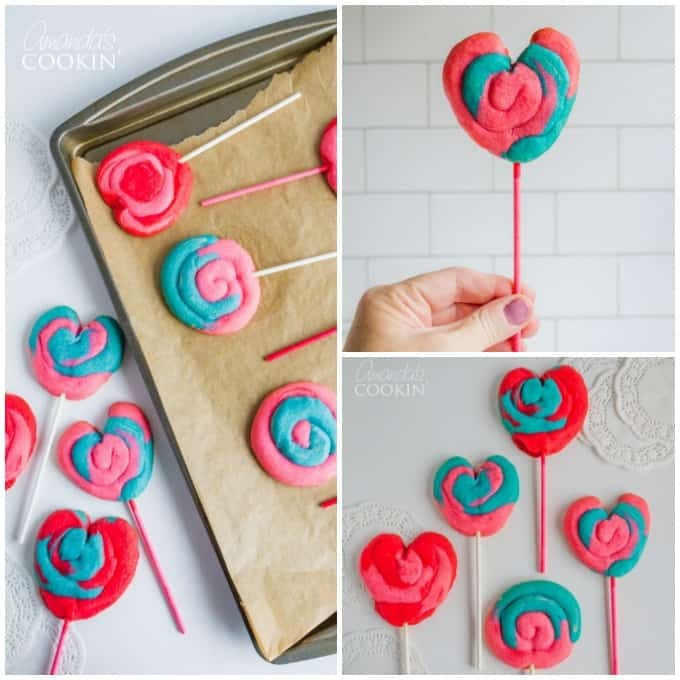 After inserting the stick, use your fingers to squeeze the dough at the bottom of the circle and combine at the stick, then use a separate lollipop stick or a butter knife to create an indent in the top and shape the heart. 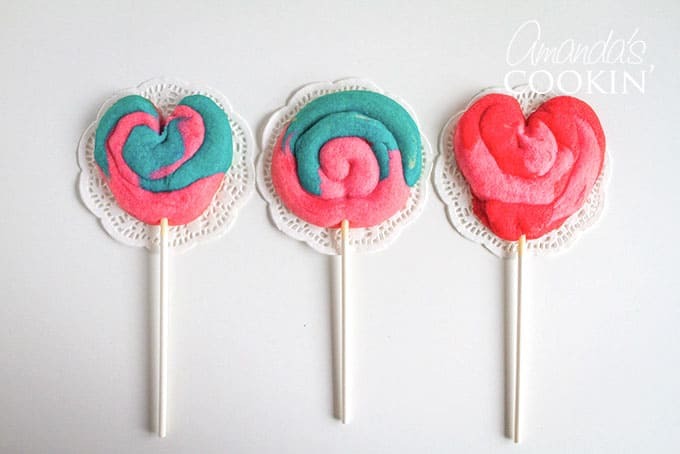 These Valentine’s Day treats would look so cute wrapped in a decorative treat bag and tied with some ribbon! Hand them out to friends, teachers, neighbors, grandparents… the list goes on! 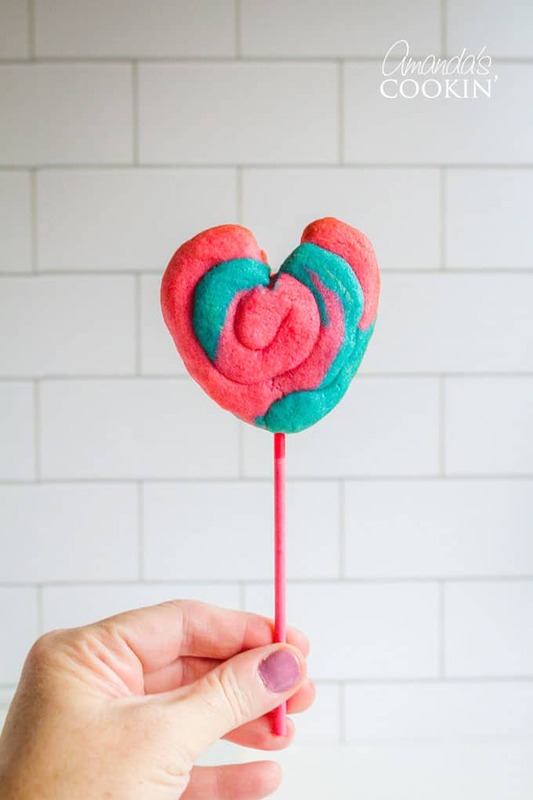 Who doesn’t love a sweet heart-shaped sugar cookie? I hope you enjoy these Play Dough Cookie Pops as much as we do! ‘Tis the season for all things heart-shaped and full of love! For more Valentine’s Day goodies check out some of my favorites below. 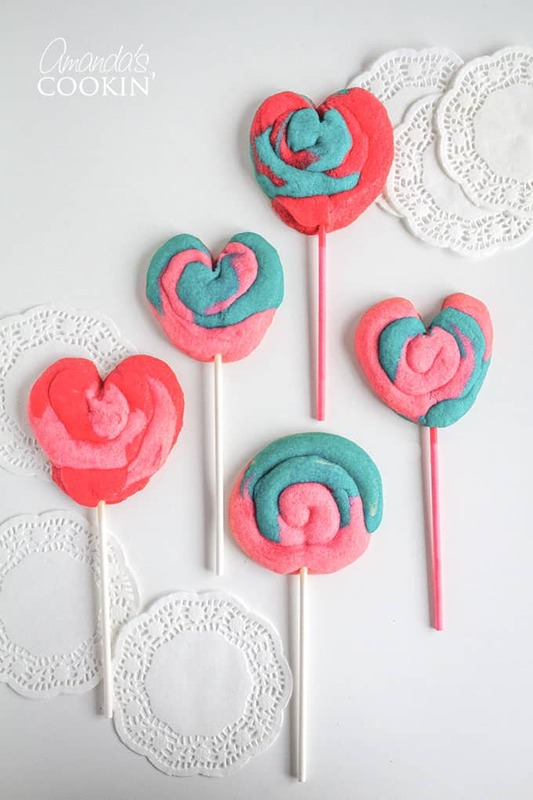 These Valentine Pops look like play dough but are just cute sugar cookies! This post was originally published on this blog on Jan 19, 2014. Hi Amanda, please I don’t know what the ounce equals in grams or cups, please clarify it to me coz I live in Kuwait and we only know measurements in cups or grams. Thanks a lot! Hi Dina, 1 ounce equals 28.3495 grams. So in this recipe, we are calling for 3 ounces that would total about 85 grams. Hope this helps!